Influencer Highlights - Advanced Nutrition Programme October 2016 | iiaa Ltd | The UK and Ireland distributor of Environ Skincare, jane iredale makeup and Advanced Nutrition Programme. "... Boost your juice.. Add one supplement (open supplement and pour powder into juice and mix) of the Skin Omegas by the Advanced Nutrition Programme to support your vitamin intake. They contain fish oil and primrose oil which provide Omega 3 fatty acids, and vitamin A which will help with inflammation and nourish the skin ..."
"...To feed my skin and nourish it from the inside out I was given some supplements from the Advanced Nutrition Programme. ...I was given Skin Accumax which I tried out before but honestly didn’t stick to as well as I should have done. This time I was advised to take 2-4 capsules a day with my meal. Taking 4 will ensure faster results so of course I’m taking 4 a day – I want the best results possible here, I’m not playing around. You can split this up throughout the day or take it all at once; I just find it easier to do it all at once. I’ve been taking this for just over a week and already all the little under the surface skin bumps and any texture I had has reduced significantly. I’ve had no breakouts – it’s been amazing. I’ll be getting my other half to try this out for definite because the results have been so quick..."
"...I just never would have thought someone of my colour would have got sun damage, I've got sun damage like not terrible sun damage but there's sun damage, there's like tiny wrinkles... not major... but the scarring she showed me fast-forward like if I carried on and didn't intervene now what it would look like... and the scarring gets worse... it definitely scared me into looking more at getting products that work... ...some Vitamin C tablets... really good for getting rid of scarring... and Skin Accumax which I've already ripped into, this one I meant to take 4 tablets a day... that's really good at calming your skin down from inflammation and getting rid of spots..."
"...I'm working with the iiaa in the #100dayreset challenge and what it basically is, is starting off completely from day one and changing my skin care routine from what I currently have, which is take off my make-up, cleanse, stick some moisturiser on my face and hope for the best and it's not really good enough. I've been using their products from their three major brands... to try and get my face and my skin the healthiest possible way it can absolutely be. So over 100 days I am going to be tracking my progress and this is day one, so about my skin now, my major issues are hormonal breakouts... supplements specifically made for your skin care, so say your standard vitamins that you'd get from somewhere else, these are like super-charged vitamins, the whole idea with that it feeds you from the inside and gets the whole beautifying process going from within. I've heard really good things about these and I'm really looking forward to using them. I'm using Skin Accumax, these are the ones for people with seriously problematic skin like me, they've got some really great stories about how people with acne have got so much better with these..."
"....in order to reform my ways, I'm working with iiaa (International Institute for Anti-Ageing) in the #100DayReset challenge to work towards getting naturally flawless skin. iiaa are the mother group of three major brands that work together in unison... The reason they work so well is because they believe in a feed, fortify and finish philosophy, with the three brands complimenting each other. 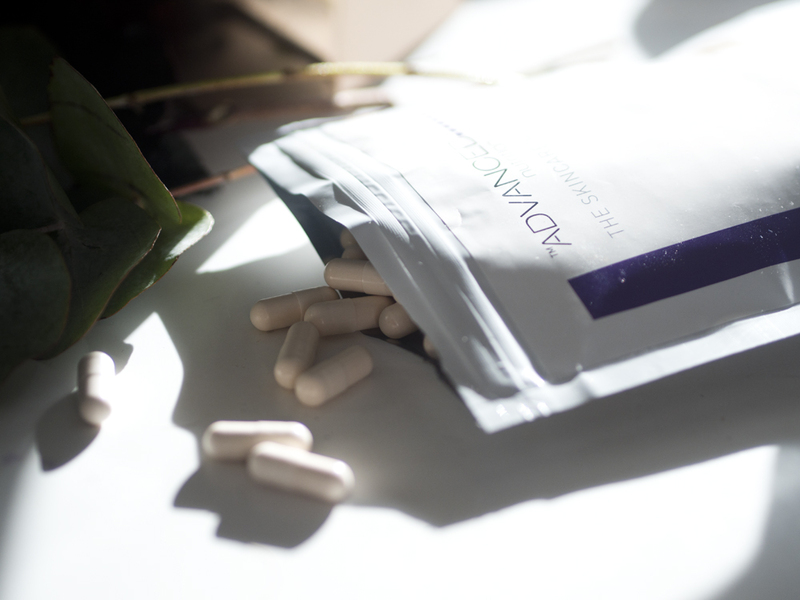 ...You take ANP supplements to give you enhanced nutrition, to start beautification from the inside. It's sort of like the saying you are what you eat. So if you put the best things in your body, it'll show through on the outside too. This is just as important as what's applied topically to the skin. Different ranges have been produced to tackle different skin issues..."
"...ANP Skin Defender Capsules – a pre sun supplement to help defend skin against the harmful effects of the sun. I’ve been taking one a day for the last 7 weeks or so in preparation for holiday, and the Vit C, E Selenium & Zinc offer antioxidant protection..."